With some 1000 participating colleges and universities in 47 US states and 7 countries QM is the premier organization for quality assurance in course design and delivery. Frederick Community College is a member of the QM community and uses the QM review protocol to certify its online courses. The protocol is based on 43 quality standards and requires a team of three certified faculty peer reviewers to determine whether the course meets the expectations of each standard. 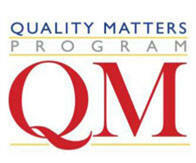 Once the course is certified, it carries the QM logo. The certification has to be renewed every four years.